I think when it comes down to it, seeing and savoring our lives as beautiful, is less of discovering hazy lit corners of our day to Instagram and more of a quiet contentedness. But when I am frustrated by how my day is going, like this morning when my two-year-old woke up the sleeping baby who’d hardly slept the night before. I wasn’t the happiest of mommas. I could feel the tailspin. My situation wasn’t ideal, a sleep-deprived momma and baby never is. My two-year-old knows it’s against house rules to open the door to his baby sister’s room (closed door = sleeping). But those two ingredients do not force me to act and speak in bitter, angry frustration. But withholding love, respect, and grace never brought anyone closer to Christ. Even if my children disobey or someone cuts me off, even if someone degrades my character or inconveniences me I can control my response. (Whether or not I will is another thing.) We know because of Jesus we can be tempted to sin, yet still refrain. Sin is always a choice. How do these less than ideal circumstances and raging emotions connect to beauty? 2. I’m the boss of me. 1. God is loving and gracious and desires to show us mercy. 2. If you do wrong in my house or to me there is no grace. The standard is perfection every time. You know what I notice in all these responses? They take all the responsibility of my response off of me and place it on my “offender.” Which brings me back to #1. I desire my speech to always be gracious (Col. 4:6). When I do this I am letting go of the reins, letting go of my assumptions and false impression of control and choosing to walk the path of light and life with Jesus. This is what it is to be content. And it’s here in this contentment where we can really trust Jesus that our lives open up to the endless possibilities of beauty. Is this the secret Paul spoke of to be content? Releasing control? May it so be with us. What do you think? 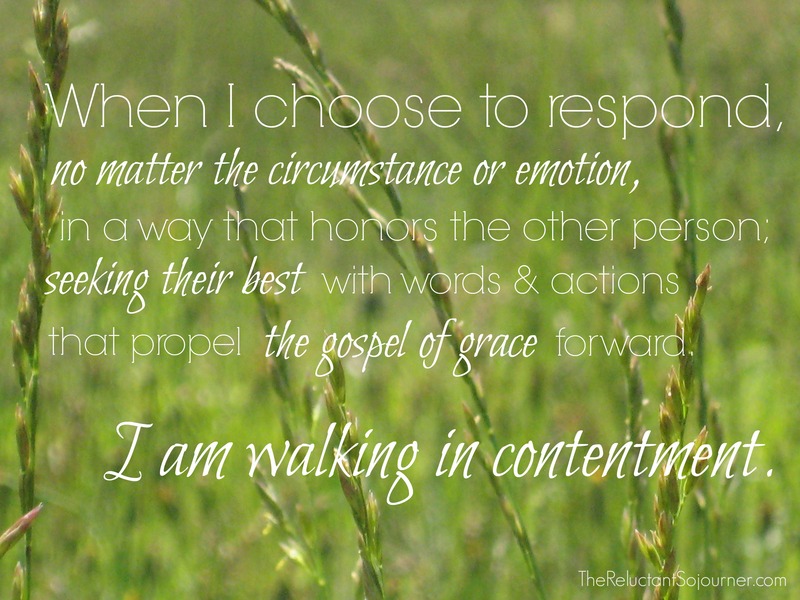 What’s contentment mean to you? Do you see control as the antithesis to contentment? I think control has a lot to do with contentment. When we lose control that’s when I notice I become discontent. As long as things are my way, I’m good.